Hi! 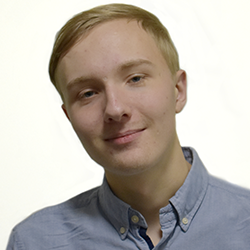 I'm Alex and I'm your LGBTQ+ Officer here at Birkbeck Students’ Union. I organise the activities of the LGBTQ+ Campaign and LGBTQ+ Society, as well as representing students on committees and the trustee board of the students’ union, working to ensure that your voices are heard! I campaign on issues affecting LGBTQ+ students and organise events and activities for LGBTQ+ students. I also work on and support campaigns with other officers, such as campaigning for automatic renewals, 24-hour library, and inter-sectional liberation campaigning. Click here to find out more and to join the LGBTQ+ Campaign or subscribe to my newsletter. Please get in touch with me by email if you’d like to be involved or for any other enquiries.